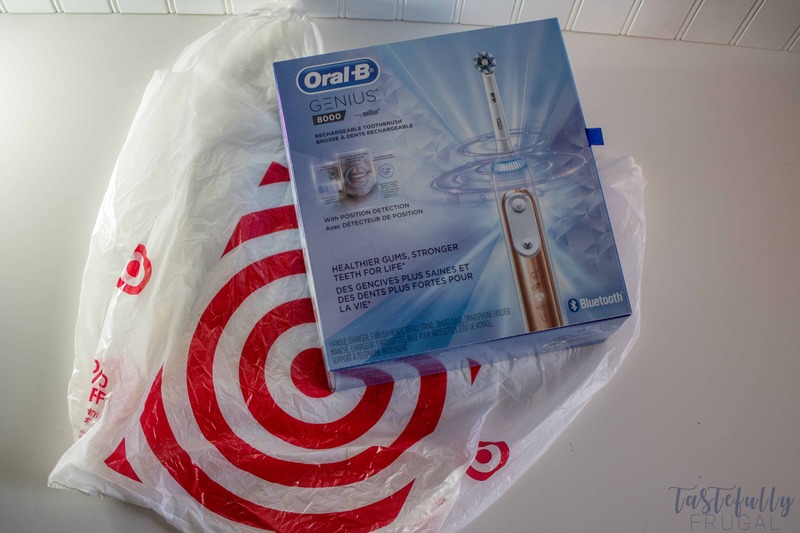 I was provided an Oral B GENIUS Rose Gold 8000 Toothbrush to review for this post. As always, all opinions are mine alone. 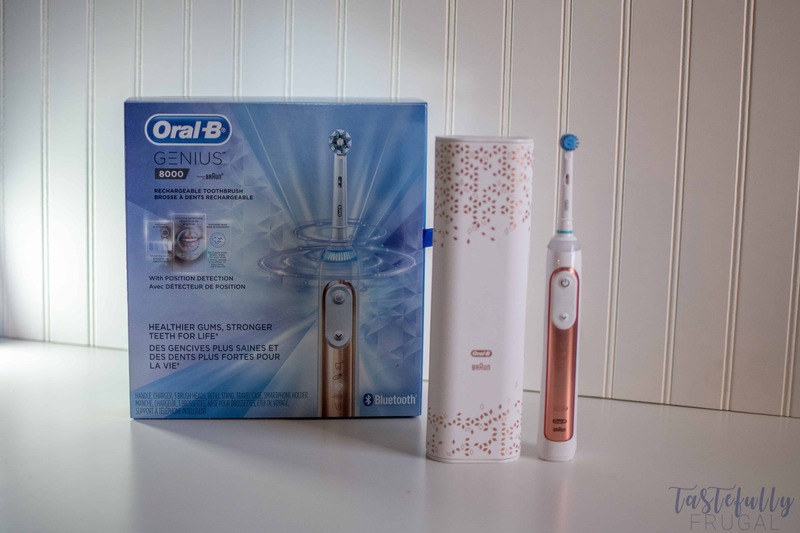 See how the new Oral B GENIUS Rose Gold 8000 Toothbrush works together with the Oral-B app on your phone to actually help you brush better AND enter to win one of these fun toothbrushes for yourself! 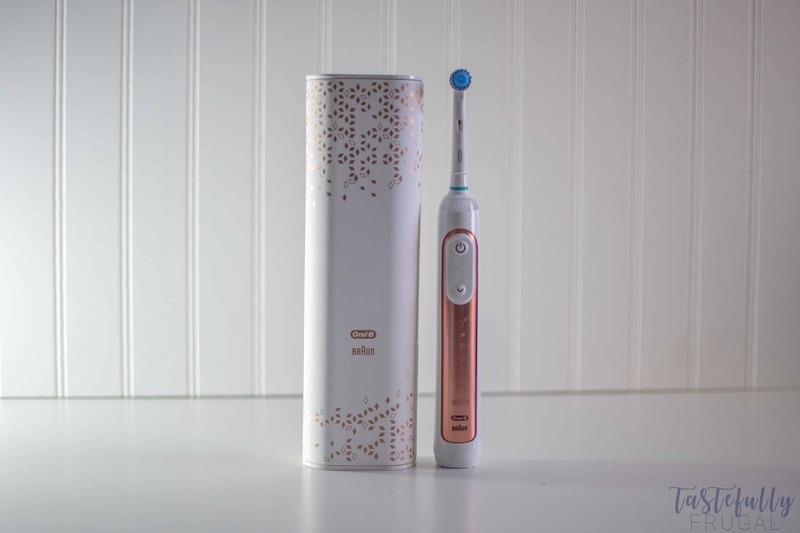 I’ve been looking for ways to improve our whole families oral hygiene habits and I found the answer in this new, gorgeous Oral B GENIUS Rose Gold 8000 Toothbrush! I’m not going to lie, at first I was more excited about this gorgeous color more than anything else; but once I started to use it, the features totally won me over too! 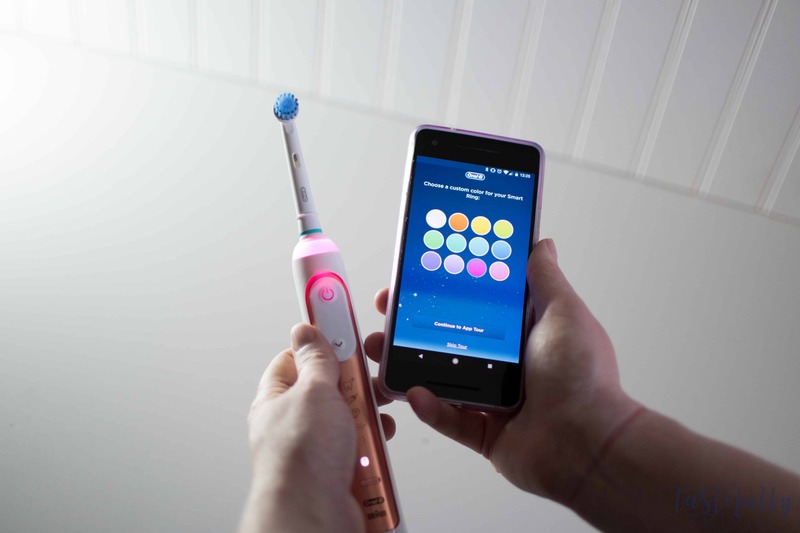 The best feature, to me, is all you can do and learn when you connect your toothbrush to the Oral B App (available on iOS and Android). 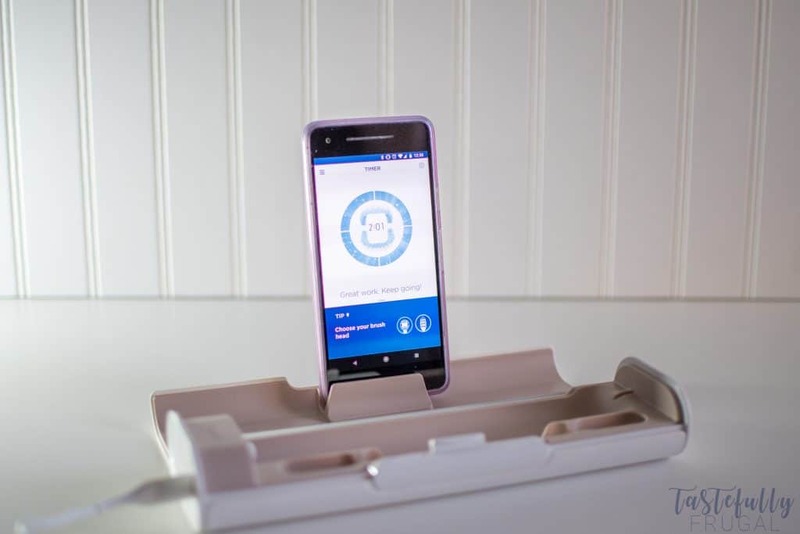 The Oral B GENIUS Rose Gold 8000 has bluetooth so once you download the app, your phone automatically syncs to your toothbrush. With the app you can monitor how long you brush (which really helps with making sure my boys and I all brush for two minutes. We brush together at the same time so they can see how I brush and how long I brush for too), track if you floss, rinsed and more. It also has Position Detection Technology that tells you if you’re brushing too hard or for too long in one area. Even sweeter, you can share the information the app collects with your dentist so you can work together to make a plan to keep your teeth healthy and strong for life! If the app wasn’t awesome enough, included with your Oral B GENIUS Rose Gold 8000, is a smartphone holder so you can attach your phone to the mirror in your bathroom and see the timer, how hard (or soft) you’re brushing and how long you’re brushing in each zone. The traveling case is an added bonus too! It’s also this gorgeous rose gold color AND it can charge your toothbrush AND your smartphone all in one plug. So if you’re looking for a way to keep yourself, or your family, accountable for your tooth brushing habits check out the Oral B GENIUS Rose Gold 8000 Toothbrush. You can find it exclusively at Target.com for $179.99 AND if you have a Target Red Card you can save 5% and score FREE 2 day shipping! Want to win one of these gorgeous toothbrushes for yourself?! Comment on this post letting me know what you need the most help with when it comes to your oral health. One winner will be selected and mailed their own Oral B GENIUS Rose Gold 8000 Toothbrush! Winner must live within the continental US. Winner will be notified by email and will have 48 hours to respond. If they don’t respond within 48 hours a new winner will be selected. I am TERRIBLE about oral health *hides face* I brush my teeth and all but I’m not so good at doing it at night…and flossing is no fun for me (I have a permanent retainer that makes it difficult). I want to do better though because I know teeth are so important and apps help me to do better at like everything! I need to do.better at her to g al the way to the back side of my back molars. It looks like it would be gentle but effective which is a great combination! I love the brush time feature, very helpful keeping an eye on the clock : ) Great giveaway! Want I need most with my oral care is dealing with plaque build up. It’s a endless battle even with flossing. Having this awesome rose gold toothbrush would definitely help me with plaque. Receding gums is my main concern. 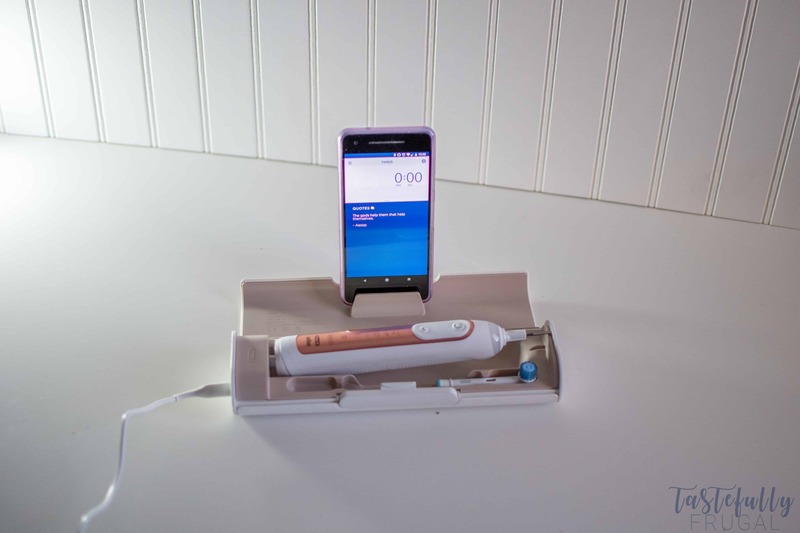 Technology has made easy to maintain our oral hygiene. These products have brought comfort into our lives.